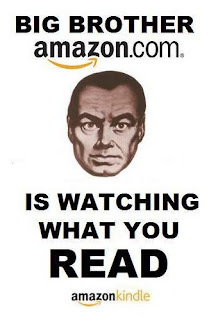 Classically Liberal: Orwell is alive and well and living at Amazon. In George Orwell's dystopian novel, 1984, the totalitarian regime uses a form of English called Newspeak. Newspeak was the use of language in a way to mislead and manipulate the public, usually by making things mean their opposite. Thus freedom is slavery and war is peace. This sort of misleading language is now being put to use by Amazon. My readers will know that I have little regard for Amazon as a company. And I am aware of how they work insiduously to screw their vendors as much as possible. One complaint I've had is that Amazon intentionally makes it difficult for vendors and customers to communicate directly with each other. Consider the following problem: a customer inadvertantly types in the wrong address. The vendor, using electronic postage, realizes that the address is wrong since he/she gets an error message. The vendor is not in a sticky situation. They may send the parcel out with the bad address knowing it will go astray but that doesn't help anyone. He could try to contact the customers but Amazon insists all communications go through them so the vendor never knows if his message reaches the customer. But when it does reach them the customer can respond directly. But vendors tell me that customers routinely do NOT respond to the messages because the messages don't appear to be important. They get lost in the clutter and the customer and the vendor have no way to contact each other directly to solve problems. But, if they leaped that first hurdle that Amazon puts between vendor and customer they were able to deal with one another directly and solve problems. The vendor, if he can't solve the problem is required to cancel the order within two days. So a small question, that could be resolved with a quick phone call, may not get resolved and may lead to a cancelled order, frustrating both the buyer and the seller. The cancellation is required by other Amazon policies. The good news was that once the customer contacted the vendor the first time, they could communicate directly. I received a copy of an email that Amazon has sent vendors. In it they announce a new police to "increase the privacy and security of buyer-to-seller communication." Here is where Orwellian newspeak comes into play. The way that Amazon will increase privacy is to ensure that Amazon "reviewers have access to all buyer-seller communications." Amazon is increasing buyer-to-seller privacy by making sure that there are no private communications between the buyer and the seller and that all communication will go through Amazon reviewers who can read what is said! If that isn't Orwellian newspeak, what is? What they will do is give every buyer and seller an email "alias" and neither the buyer nor the seller will ever be allowed to know how to contact the other directly. Amazon also uses electronic censoring to detect attempts to ask for direct communication, so phone numbers or direct email addresses are detected and the email is blocked from the intended recipient. Greater privacy is obtained by making sure that Amazon reviewers can now see every communication. And Amazon will decide whether or not the recipient is allowed to see the email or not. Amazon says this eliminates "unneccessary contacts." But by whose defintion? This is not enhanced privacy and security. It is the exact opposite. Amazon is lying by pretending that this improves privacy. Amazon acts with a heavy hand, or a heavy boot depending on how you look at it. This isn't the first time they've acted more like the Soviet Politburo than like a business and as they grow the similarities will no doubt increase. But now they have taken to blatant distortions of the meaning of words. If the Obama administration followed the same sort of twisted defintions used by Amazon they could give us total privacy by having everything we do reviewed by a government bureaucrat while we are doing it. Increased surveillance is not greater privacy and you should tell Amazon so. They ask for "feedback" though they have a tendency to ignore it, much the way politicians ask for feedback on new taxes and then pass them regardless of the outcry. You can contact the Amazon Politburo at sellers-change-feedback@amazon.com. Of course, in order to enhance your privacy, you should have it reviewed by a third party first. And just think, for all those years George Bush was actually increasing our privacy and I never realized it. Thank you Amazon, for enlightening me. Surveillance is privacy. War is peace. Ignorance is strength. Freedom is slavery. Now all Amazon needs to do is institute two minutes of hate daily. posted by blog owner at 2/17/2010 08:18:00 PM DiggIt! Reddit Del.icio.us Slashdot It!